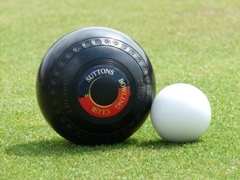 Bowls is a relatively cheap game compared to other sports and you will find below a basic introduction to the sport, but for more information on the cost of playing contact our club secretary. Like many games, the object of bowls is essentially simple. It can be played by anyone of any age, but to play consistently well demands determination, concentration and practice. The game is played on a square of closely cut grass called ‘the green’, which is divided into playing areas called rinks. The green is surrounded by a small ditch to catch bowls which leave the green, and a bank upon which markers indicate the corners and centrelines of each rink. small white ball called the jack at the other end. The bowls are shaped so that they take a curved path towards the jack. To be successful the bowl must be delivered with the correct weight, along the correct line. Some Bowls Shoes and Grey Trousers/Skirt and a white or Club Shirt.We have a selection of Bowls which you can be initially borrowed and left at the club. Cost new from £80 – £180 per set of 4 or can be purchased second hand.